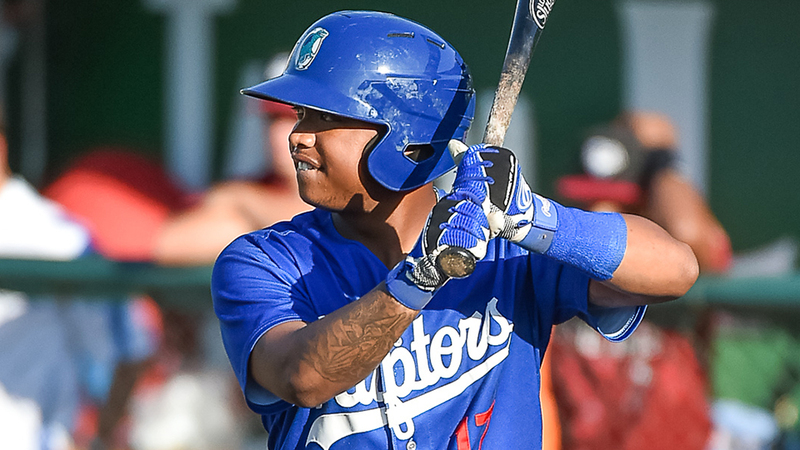 When Willie Calhoun was young, his father, Willie Calhoun Sr., always tried to put a heavier bat in his hands, the idea being it'd make for stronger wrists and more bat speed. All these years later, the slugging second baseman is reaping the rewards, now as a prospect in the Dodgers system. The fourth-round Draft pick homered, doubled and drove in five runs Sunday to lead Rookie-level Ogden to a 12-2 romp over visiting Grand Junction at Lindquist Field. The five RBIs are a high for Calhoun in his first 17 games with the Raptors, while his five homers leave him tied for third in the Pioneer League. As great as those numbers make his Sunday performance look, Calhoun's day could have been even better. Coming up with two runners on in the sixth, the left-handed slugger connected on a shot down the right field line off right-handed reliever Kelvin Franco for what he thought would be a three-run homer. Instead, it was called foul. "I was really frustated," Calhoun said. "I thought it was fair, but I guess we just had different points of view, so I just had to go with it. It was unfortunate." His response? He doubled to right to drive in Deivy Castillo and Deion Ulmer for his first two RBIs of the night. He finally got his roundtripper two innings later when he launched a three-run shot to right that started a five-run eighth. Calhoun has been no stranger to homers in 2015. After choosing not to sign with the Rays, who took him in the 17th round of the 2013 Draft, he attended the University of Arizona. He struggled as a freshman with the Wildcats, hitting .247/.345/.301 with no homers, three triples and five doubles in 46 games. He transferred to Yavapai Junior College, becoming eligible for the 2015 Draft, and tore it up on the JUCO circuit, batting .432/.520/.952 with 31 homers and 85 RBIs in 63 games. The Dodgers snagged Calhoun in the fourth round last month and signed him for $347,500. He hasn't exactly been able to replicate those video game numbers in the Pioneer League, where he has a .261/.338/.536 line in 17 games. But the power certainly has made the trip with him to Ogden. "I'm just staying with the same approach," Calhoun said. "I thought it'd be a little different here than in junior college, but after my first game [on June 18], I saw I could stick with what had been working the last six months. .. Just stay inside the ball and hit it as hard as I can." With a style like that, it's not a huge surprise that Calhoun's loudest tool is his power. What is surprising is that he's able to generate that much power from a 5-foot-9, 177-pound frame. Power hasn't been a problem in the Pioneer League -- the most hitter-friendly of the Rookie-level or Class A Short Season circuits -- but the way Calhoun sees it, power won't be a problem as he continues his pro career. "It's just something God has given me," he said. "I've always used my hands as power to get my bat speed up. When I was a little kid, my dad was always putting a heavier bat in my hands to work on that stuff. And from there, I've just tried to work my tail off as I got older." Calhoun wasn't the only Raptor who had a big day Sunday. Ulmer was 4-for-4 with a double, a walk, a stolen base and three runs scored out of the leadoff spot, while right fielder Michael Medina doubled twice and drove in two runs.